Jakarta, December 7 2015 - Providing business travelers and creative professionals with instant access to thousands of affordable meeting spaces, Archipelago International has partnered with XWORK – an app offering the simplest way for working professionals to book a work or meeting space, quickly, easily, anytime, and anywhere. XWORK is a technology company that connects customers with private meeting rooms, up to a maximum capacity of 25 guests. With the XWORK app, finding a meeting space is no longer time consuming, instead offering an easy way to find available rooms to suit individual needs, with the added bonus of being able to book the space in less than 45 seconds. Spaces can be booked on an hourly basis for room rental only. Standard meeting rooms include Wi-Fi, mineral water, and the appropriate furniture, whilst food, drinks, notepads and other facilities like projectors, are offered at additional costs according to availability. With the XWORK app, customers will be able to book meeting spaces at Archipelago International hotels anytime and anywhere in Jakarta. Whether customers are stuck in traffic, require a meeting room in a hotel or private boardroom, or simply if professionals are looking for a meeting space nearby yet outside their office, customers can easily find an appropriate space via the app. 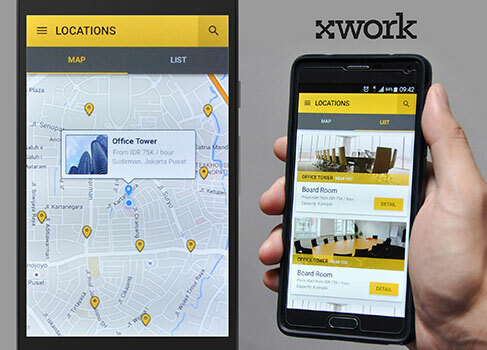 The XWORK app was initially launched in Jakarta and planning to expand to other regions. XWORK introduced the beta version in Google Play Store for Android users on last December 3 2015 and planning to launch the app in App Store for iOS users in early 2016. “With the surge of OTAs in the travel sector, searching for a hotel has become much easier and more transparent for guests. We are thrilled that XWORK is helping to do the same for small-group meeting spaces too, and we are very excited to become a part of it. Archipelago International already offers a search feature on its website for larger meetings and events, helping organizers find the perfect space for both corporate and social needs.” Said Tenaiya Brookfield, Vice President Sales & Marketing of Archipelago International. Archipelago International is one of Indonesia's leading hotel operators with a portfolio of over 110 hotels and 15,000 rooms. As a continually expanding brand, Archipelago International has a development pipeline exceeding 100 properties in Indonesia, the Philippines, and Malaysia. Archipelago International brands include: favehotel, NEO, Quest, Harper, Aston, Alana and Kamuela. Archipelago International's properties range from ultra-luxurious villas with private pools to select-service, economy-class hotels to serviced-apartment residences, thus offering Indonesia’s largest and most comprehensive hospitality network.